On November 15, 2017, BP Regional President for Azerbaijan, Georgia and Turkey Gary Jones visited Baku Higher Oil School (BHOS) and met with BHOS professors, teachers, students and staff members. The meeting also gathered representatives of management of BP, other oil companies and international and local mass media. At the meeting, which was held at Congress Hall of the Higher School campus, Gary Jones conducted a master class entitled “Leadership”. Opening the meeting, BHOS Rector Elmar Gasimov welcomed the guests and expressed his gratitude to the BP Regional President for making an important, timely and up-to-date presentation. The rector extended his congratulations to the company on 25th anniversary of its activity in Azerbaijan and highly praised the company work on implementation of socially important projects in the country. 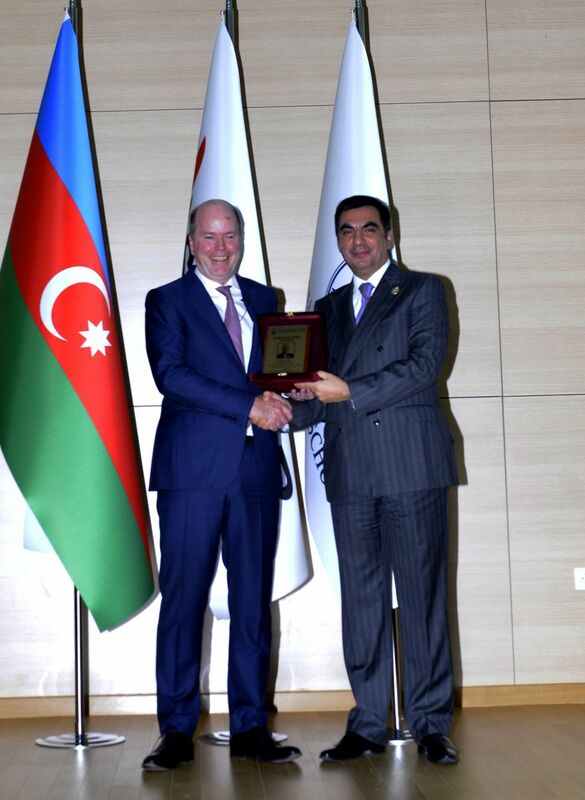 Then Elmar Gasimov awarded Gary Jones with BHOS Honorary Guest Diploma for his great attention to Baku Higher Oil School and for valuable contribution to development of cooperation between BP and BHOS. BP Regional President Gary Jones expressed his appreciation to Elmar Gasimov for the close cooperation. He emphasized that support for education in Azerbaijan including training of specialists for oil and gas industry is one of the main directions of BP social investments programs. He also noted with satisfaction that five out of 13 oil and gas engineers employed by BP in 2017 were BHOS graduates and that 14 out of 26 undergraduates who undertook summer internship at the company this year were students of the Higher School. In his speech, BP Regional President told about successes achieved by the company within 25 years of operations in Azerbaijan, BP nationalization policy and special internship and employment programs for students and graduates offering them a wide range of career opportunities at the company. During the presentation, Gary Jones shared his vision and thoughts about leadership and discussed with students issues related to development of leadership qualities and specific features inherent in a true leader. The speaker also told about his own professional experience at BP, which began back in 1981, milestones in his career and main fields of expertise. In conclusion, Gary Jones answered numerous questions asked by the participants.